Accelerate productivity, make insightful decisions, and increase safety! 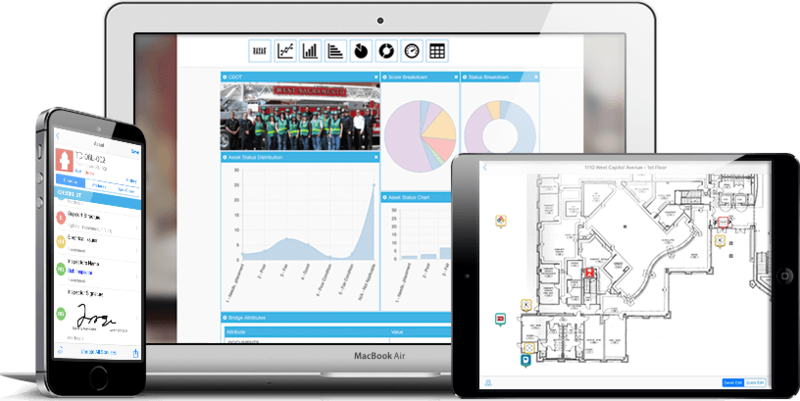 Whether its your routine inspections, mobile reporting, managing your occupancy inventory, running your billing reports, team performance monitoring, managing hydrants or other intelligence tasks our platform has got you covered. We match your specific workflows, migrate your data from old tools, and stay by your side even after you Go Live! Get your organization off paper or some complicated legacy tool so your team is more efficient, smarter and even happier. Raxar Technology is proud to deliver a robust and intuitive solution for first responders from your crews to inspectors and Chiefs. Collaborative and easy-to-use, Raxar offers an efficient and effective way to manage your routine inspections, ad-hoc inspections, violations, hydrants or other structures, final reporting, and interaction with your finance team for billing (if applicable). 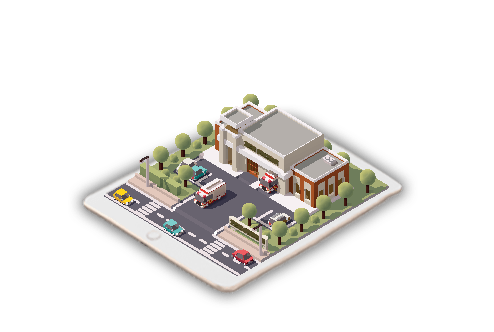 Our first responder inspection software streamlines activities such as the pre-planning process, routine inspections, reporting, and even other workflows like Hydrant management or vehicle management. Talk to us today to see how we can replace or improve your legacy system, simplify your team's workflows, and help increase the safety of your citizens and team members. For quite some time there have been a few corporate solutions that tried to help first responders take care of their recurring activities, such as routine inspections, but those solutions are clunky, expensive, inflexible and time consuming. That is why we enlisted the help of actual first responders to help us develop a solution that matches your team's needs, while being simple to use and informative. Help get your team the right tool to make their jobs easier, while maintaining better information that will help you keep your citizens and first responders safe. Improve your First Responder Operations! Once implemented, the Raxar First Responder System can be utilized to easily capture photos; draw markups; leverage voice-to-text documentation and reference non-compliant findings on map and plan views. 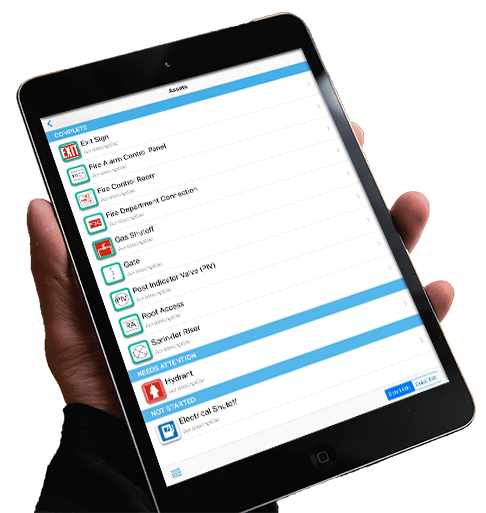 Fire & Life Safety inspection management software that helps your team be efficient, accurate, and even more profitable. 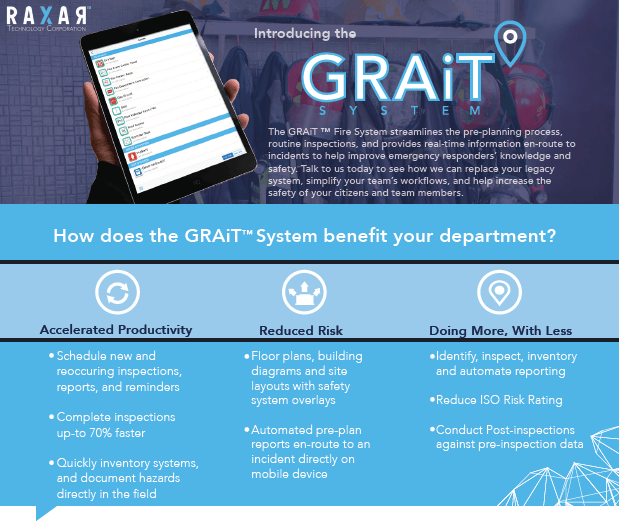 Learn more about the software that is being used by some of the largest fire departments in the country that is saving them 90% of their time on scheduling and 80% of their time on inspections through billing.